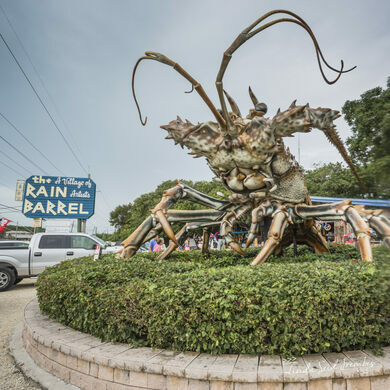 Because nothing is too terrifying to create a giant novelty version of, the Rain Barrel artist’s village in Islamorada, Florida is home to “Betsy,” a massive roadside lobster statue the is a serious contender for the title of world’s largest lobster. Former utopian colony based on the belief that the universe exists in a hollow sphere. Modeled in eerily life-like detail, Betsy is huge spiny lobster that was originally created in the 1980s to celebrate the species which is native to the Florida Keys. Unlike many of its brethren, spiny lobster do not have claws, but as Betsy shows in massive detail, they don’t need them to be alien and frightening. The lobsters’ carapace is covered in sharp spikes and it features a handful of long antennae which are probably not used as whips… but could be. Betsy’s original home was in the south Florida Keys where she became a popular photo destination rivaled only by the tip soft the Keys themselves. 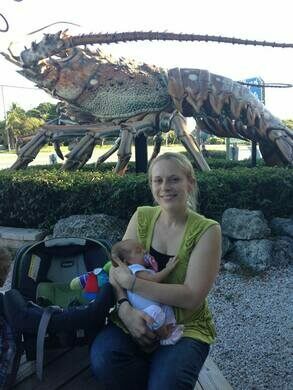 However, in 2009 the monster crustacean was moved to a new location in front of the Rain Barrel Artisans’ Village in Islamorada. At around 40 feet long and nearly 30 feet tall, Betsy is not just a living nightmare, but may also be the largest lobster in the world despite some vocal opposition from a fiberglass creature in Canada. Hidden deep in the swamps of Florida’s Fakahatchee Strand, a ghostly pale orchid hides from poachers while the eye of an enormous alligator surfaces, blinks, then disappears beneath the murky waters that wind through the forest. Join us for a 5-day adventure as we search for those rare orchids, paddle our way through mangrove forests, and snorkel alongside sea turtles, all in the company of an experienced naturalist guide. The famous boat that once ferried Bogart and Hepburn still floats in Key Largo after being abandoned for years.